Have you ever wondered what we really do all day long at W+K HQ, other than shuffling bikes around in our lobby and enjoying alfresco lunches with our clients? 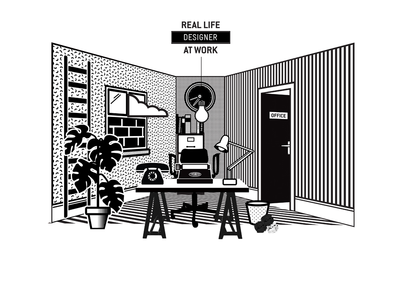 Well now you can see it for yourself through the gloriously monochromatic lens of our latest window installation, Real Life at Work. Our Hello Neighbour team Karen Jane, Maya Roberts and Amy Leach have collaborated with graphic artist Emily Forgot and Laurie D to create Real Life at Work, a new living, breathing workspace specially created for our window to give the outside world a look at the way we work. Emily says of the project "I'd been wanting to get a cheese plant into my work for a while so W+K's window proposal provided the perfect opportunity … which office doesn't have a cheese plant! That aside, I enjoy playing with scale and pattern in my work as well making the mundane slightly surreal, so its was nice to incorporate all my aesthetic leanings into the brief. It was also fun to work with Laurie D who not only brought mechanical elements to the mix but collaborated with me on bringing the space to life. " 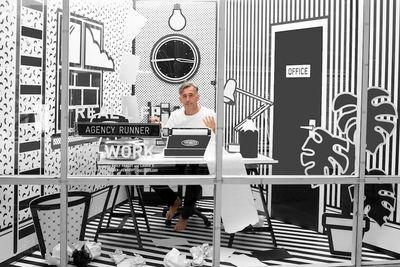 Check out Mr Tony D, our 'agency runner', coming up with some pure creative gold in the window. 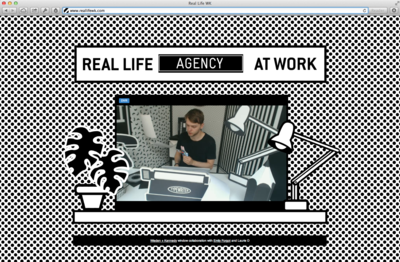 You can keep an eye on who's working in the window on our live video feed over at www.reallifewk.com, made possible by the industrious Will Hooke, who can be seen here in a very accurate portrayal of the office at the moment – enjoying an ice cream. If something particularly entertaining catches your eye in our window, take a little snap or a screengrab and think of your wittiest caption, tagging your Tweet with #helloneighbour. The best caption each week will win something truly special: the chance to say you've worked at W+K London (well, at least in our window). 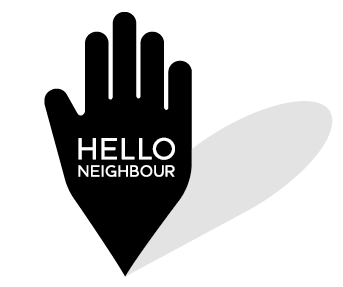 Hello Neighbour is a creative initiative in which W+K extends a friendly handshake to our infinitely inspiring creative community. We regularly collaborate with local talent to create inspiring, jubilant and occasionally spine-chilling installations in our Hanbury Street window. If you work or live within a one-mile radius of the agency and would like to collaborate with us, the Hello Neighbour team would love to meet you. Email hello.neighbour@wk.com.